Blue porterweed, photographed at Green Cay Nature Center, Boynton Beach, Palm Beach County, in july 2013. 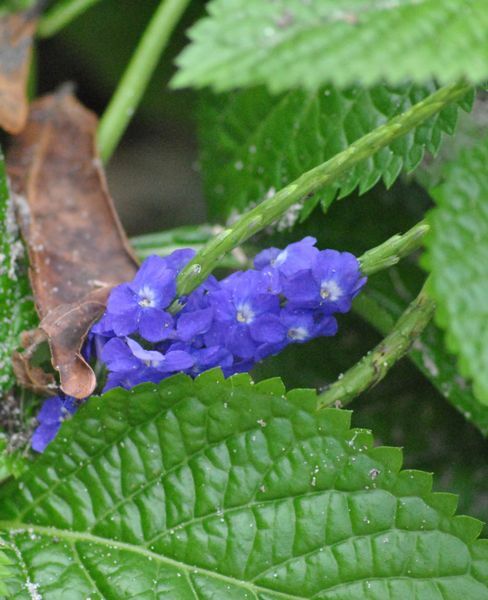 Blue porterweed, Stachytarpheta jamaicensis, isn't known for its stunning floral display. Far from it. The flowers are pretty enough, but they're small, as is the quantity in bloom at any one time. But if you're into butterflies and butterfly gardens, this is your plant. It is a virtual butterfly magnet — the list of species it attracts is extensive. 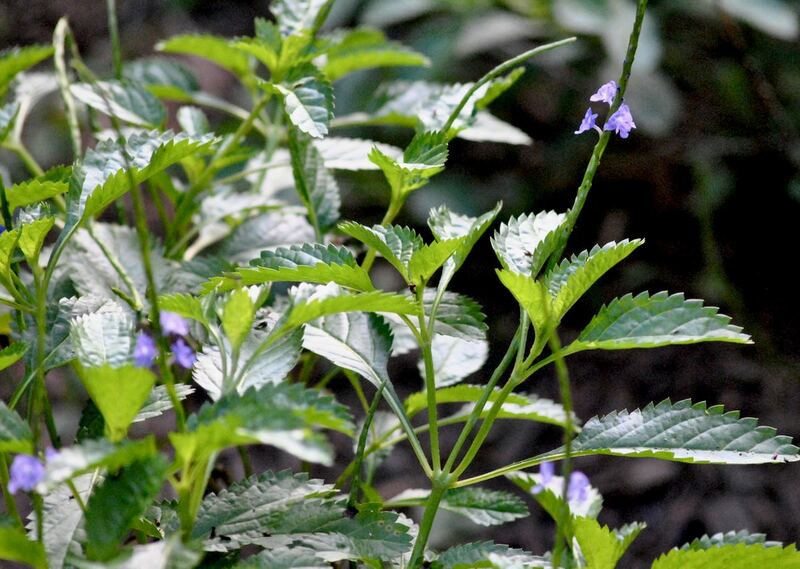 But we do have to include a note of caution: make sure you buy the right blue porterweed — the name is also attached to a similarly looking cousin, Stachytarpheta cayennensis, that the Florida Exotic Pest Plant Council lists as an invasive. Our blue porterweed is believed to be native to at least part of Florida, the coastal areas of Collier, Miami-Dade, Monroe and Lee counties, but an import to the rest of the state. (We've seen a theory that it came to our shores in the 1700s, which would mean that it is technically not native.) The U.S. Department Agriculture's PLANTS database also includes Alabama as part of it natural range. Blue porterweed is found in Bermuda, the Bahamas, the Caribbean, Mexico, Brazil and Ecuador. It is a shrubby plant, round in shape, growing to about three or feet tall and about as wide. Favorite habitats include rock barrens, marl prairies, rock pinelands and disturbed areas. The leaves vary from one to almost five inches long; they're simple, arranged opposite on the stem, lance- or oval-shaped, with coarse teeth along the outer edge. Visually, the most distinguishing feature are the unusual, long flower spikes; they are the source of genus name, stachytarpheta, thick spike in Greek. The plant blooms year round, but less so in winter. Flowers appear on the spike a few at a time from the bottom progressing toward the top. They last about a day, but the spike will continue to produce flowers for months. Blue porterweed doesn't bloom at night, and sometimes not on cloudy days. Blue porterweed isn't a fidgety plant. It will grow in poor soil, is highly drought tolerant once it is established, takes to full sun and is a fast grower. 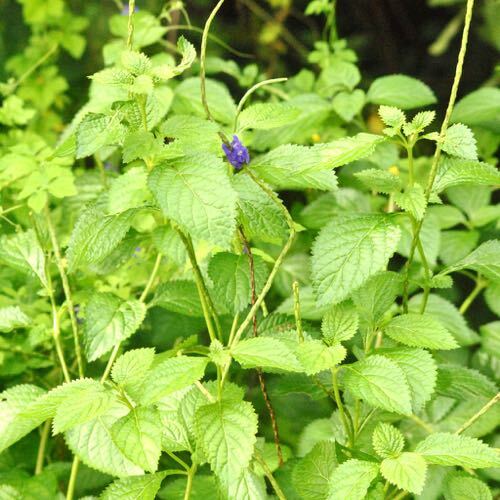 It can be used as a ground cover because of its somewhat sprawling ways and, because the stems become woody as the plant matures, as a hedge. It is a host plant for tropical buckeye butterfly and a source of nectar for many others, including the clouded skipper, gulf fritillary, red admiral and julia. Blue porterweed is grown extensively in butterfly gardens, especially in South Florida. As a bonus, hummingbirds will feed from the flowers. In places within its range, it's used in making a beer-like beverage, which is why it's called porterweed, porter being a style of English beer. Don't want the alcohol? It's also used to make a foaming tea that looks like beer. Blue porterweed is also widely used medicinally within its range. In the Bahamas, the tea is used to break fevers; a wash is made to treat skin problems. It's used to treat constipation and to treat worms in children. In places, it's used to treat an array of respiratory problems, including colds, cirrhosis, hepatitis, to lower blood pressure and stimulate milk production in breast-feeding moms.